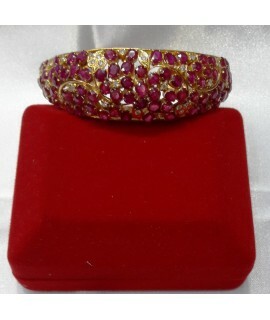 ALL ROUND RUBY BANGLE - The same size ruby are placed all around the ring. This fancy and elegant ring is very popular among ladies of all ages. ruby are Natural Myanmar and have nice color and clarity .Bangle is made of 18 k gold. Certification will be provided for every product. 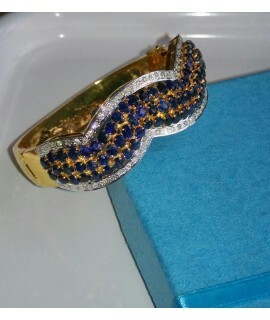 Weight ;26.8 k..
ALL ROUND SAPPHIRE BANGLE - The same size sapphires are placed all around the ring. This fancy and elegant ring is very popular among ladies of all ages. Sapphires are Natural Myanmar and have nice color and clarity. Weight of sapphire 16.35 ct.Bangle is made of 18 k gold. Weight ;21.41 gm..